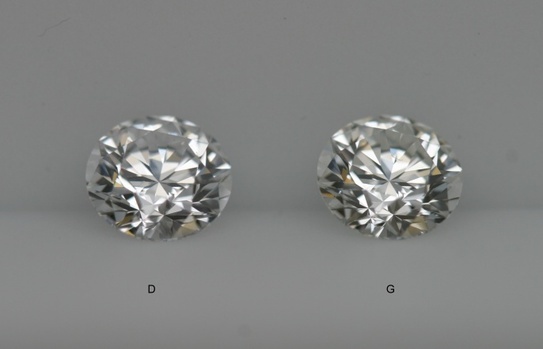 Near colorless diamonds are comprised of the colors G, H, I, and J. 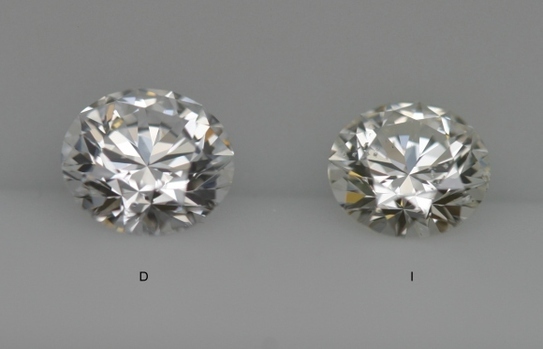 Near colorless diamonds are diamonds that, face up in the mounting are still "colorless" or white. If I were to put a G or an H color next to an E or an F, the average person would not be able to tell the difference. 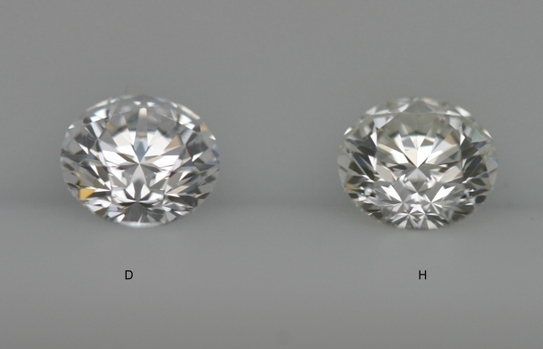 To see the difference, it is necessary to view the diamonds against a flat white background. 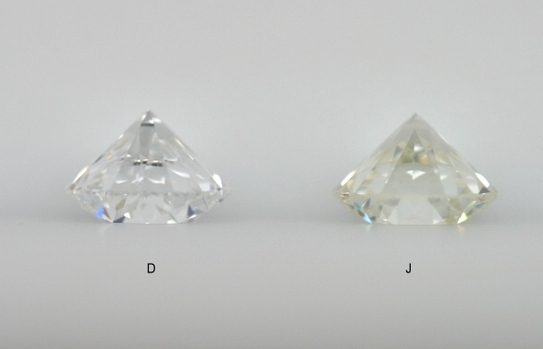 The three most common colors that diamonds decrease to are yellow, brown, and gray, with yellow being the most common. Brown is the next most common. 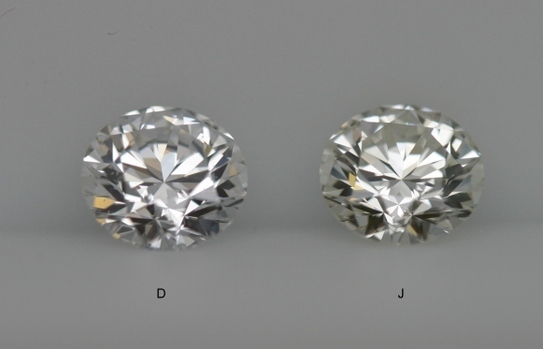 Brown or light brown stones are advertised as "champagne" diamonds. Despite the name, they are among the cheapest diamonds. Gray is the rarest. 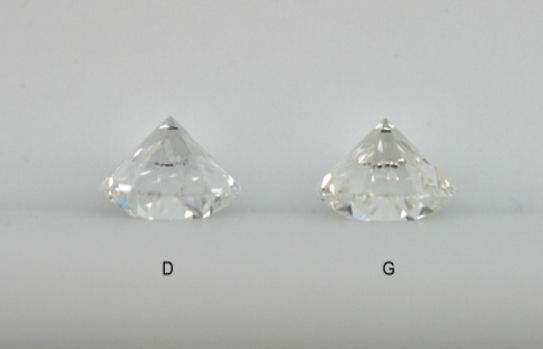 Figure A shows G, H, I, and J diamonds alongside each other against a flat white background. 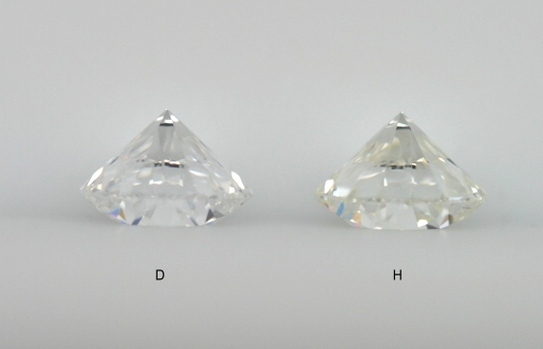 Figures B, C, and D show the contrast between a D color and various near colorless diamonds against a flat white background both face down and face up under northern daylight fluorescent lighting.  This is perhaps the most critical view you'll ever see of diamond color. Face up and mounted in a ring it's almost impossible to see these color differences. In the two images of the G color next to the D color, you can barely make out the faint nuances that exist between near colorless vs colorless categories. Viewing this difference is only detectable because of the grading environment used in these images. When a diamond in set into a ring the color difference will be almost impossible to see. Notice the ever so faint warmth of color in the J?  Generally this is only visible against the flat white background and even then it really is very "faint". It's not like comparing a white diamond to a yellow diamond. You will see saturation of this tint start to increase as we go further on down the scale. 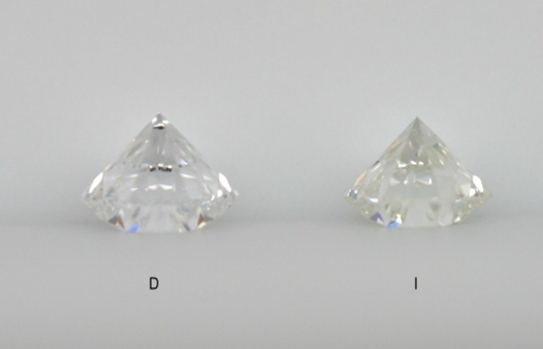 All of the colors covered to this point (D-J) are considered to be "white" diamond and do face up beautifully after being set.  There are a couple of factors that can help neutralize the appearance color which we will cover in more detail as we progress.